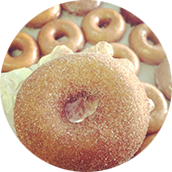 Made Fresh Daily at Oves! It all started in 1965 when Tom Oves Sr. decided it was time to retire from the Ocean City Beach Patrol and get into a business that would meet his family’s needs. Tom started a small fleet of bikes for rent in front of the Delaware Hotel at Park Place & the Beach and branched out to the Boxwood Café at 4th and Atlantic Avenue. When the people came back from biking, they would ask Tom, “Where’s a good place to have breakfast?” That’s when Tom got the idea to open a beach stand. In 1968, Oves found a beach lot that was available at 4th & Boardwalk. He moved the bike business to the beach and started a small grill. At that time the boardwalk was in front of the beach stand. The stand was built on pilings so the ocean wouldn’t carry it away which is how it got its Original name Oves’ Hi Spot. 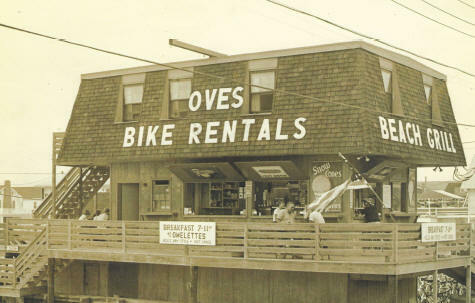 In 1979 The city redesigned the boardwalk moving it closer to the street which connected the store to the boardwalk and they changed the name to Oves’ Beach Grill, later to Oves Restaurant. In the early 1980’s the dining room was expanded and a second floor added. In 1990, the boys, Tom jr., Chris and Alex decided to open a Seafood Restaurant in the evening. It was an overnight success. They quickly became famous for the quality of their seafood and other tasty culinary delights. Now the second and third generations of the Oves family are serving the public. Anne and Tom were blessed with four sons and eight grandchildren, as they have plenty of help. Along the way, the second floor was made available to host private parties. They also sponsor the Miss New Jersey Pageant Breakfast upstairs. Anne’s famous saying was “Weather or Not,” meaning business depended on the weather, but that is not true at Oves, because it is an open-air restaurant with a roof and sliding windows. People love the atmosphere and the awesome views. The food is delicious, the price is right and the view is spectacular; a winning combination for the last fifty years.